Housing sales declined as the Texas border economies stagnated amid payroll reductions. Residential construction and permit activity remained sluggish, although nonresidential construction values picked up. Retail activity benefited from the appreciation of the peso, but increased wait times at the ports of entry and an uncertain maquiladora environment might hinder trade activity. Housing prices continued to rise, but real wages struggled to keep pace, underlining ongoing affordability troubles. 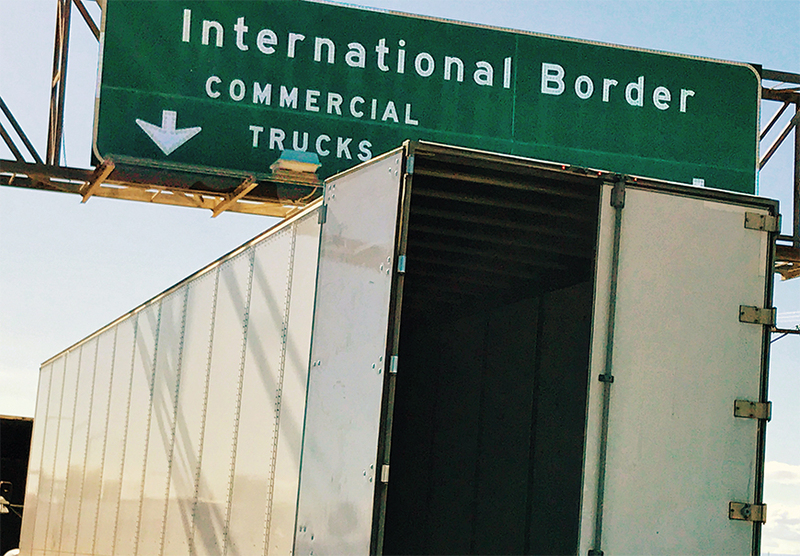 The greatest headwinds to the border economies include political uncertainty regarding immigration reform and trade. February data revealed sluggish economic activity across the Texas border metros as indicated by the Dallas Fed's Business-Cycle Indices. 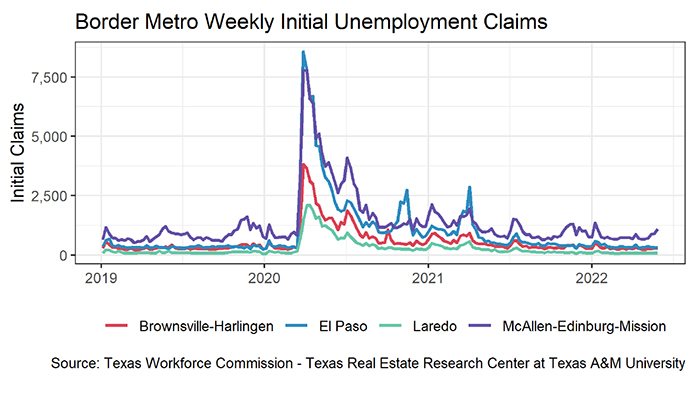 Stagnant job growth and below-average wages remained a hindrance to Brownsville and Laredo as their indices fell 0.5 and 3.6 percent, respectively. McAllen's index decelerated to 0.5 percent growth while the El Paso metric fared better, inching up for the third consecutive month to 0.9 percent. Nonresidential activity corrected after January's lapse, elevating total border construction values 14.9 percent. After a pause last month, school construction in El Paso resurged while the Port Grande Logistics Port warehouse project broke ground in Laredo. On the other hand, residential values lagged below long-run averages as multifamily activity paused in all metros but Brownsville. Nonfarm employment contracted along the border, netting a loss of 600 jobs. Brownsville payrolls stagnated as the information and goods-producing sectors offset retail improvements. Laredo corrected for a four-month streak in transportation/utilities and leisure/hospitality gains, shedding 300 positions. In El Paso, manufacturing and professional/business services comprised the majority of the metro's losses. Also notable was a contraction in mining/logging/construction after eight months of growth. McAllen was the exception, adding 400 jobs on top of revisions boosting January payroll expansion from 400 to 900. Education/health services supported growth, hiring 2,000 employees within the past two months after fourth-quarter losses. On the Mexican side of the border, manufacturing and maquiladora employment1 started the year out strong with the addition of 6,800 jobs in January. Juarez and Reynosa reached all-time highs, adding 5,400 and 1,300 jobs, respectively. After a two-month stagnation, Nuevo Laredo posted 4.0 percent growth while Chihuahua followed close behind at 3.3 percent. The exception was Matamoros, where thousands of workers went on strike in hopes of higher wages, registering a 2,300 contraction. The union's overall success may encourage other maquiladora employees to follow suit. Unemployment rates along the border dipped but remained slightly above historical lows recorded in November. El Paso and Laredo posted 4.3 and 4.1 percent compared with 4.0 and 3.7, respectively. In Brownsville, joblessness registered 6.0 percent, up 0.4 percent from the all-time low. McAllen unemployment stabilized at 6.5 percent, increasing half a percent in the past two months. Real private hourly earnings rose as McAllen posted YOY improvement for the second straight month. Although earnings in El Paso stagnated in February, the metro recorded 4.4 percent YOY. Brownsville wages extended an 11-month YOY increase but have yet to recover lost earnings from a four-year slide between 2013 and 2017. The exception was Laredo, where real wages registered a 27-month decline. The data, however, show the rate of decline decelerating. In the currency market, the peso per dollar exchange rate fell to 19.17 in January while the inflation-adjusted rate2 recorded a four-year low. With El Paso leading the way in terms of growth for exports values and McAllen for import values, the total value of border trade activity3 rebounded 4.6 percent after falling for two straight months. 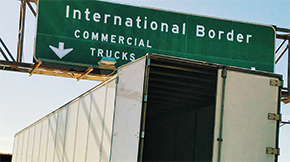 Increased wait times at ports of entry is a threat to the border metros' trade activity which remains an integral component to the local economies. Border housing sales flattened after a hike to start the year. Activity in El Paso fell 3.5 percent as transactions slowed for homes priced less than $200,000. Laredo sales took a step back after reaching a record high last month but maintained an upward trend. Similarly, McAllen activity decelerated after a boom in January. Brownsville was the exception, breaking a three-month streak of waning sales amid rebounding transactions in the resale market. On the supply side, the border metros issued a total of 626 single-family housing construction permits, a 5.1 percent decline after three consecutive increases. The overall trend remained flat in the Rio Grande Valley with minor fluctuations over the past five years. Permit issuance in El Paso fell but remained above October's cycle low of 116 permits. The exception was Laredo, where permits posted their highest post-recessionary level so far at 109 permits. Private single-family construction values trended downward along the border except in Brownsville, where values flattened after January's boom. The months of inventory (MOI) of homes for sale varied across the border metros. Brownsville and El Paso dipped to record lows of 8.0 and 3.6 months, respectively. 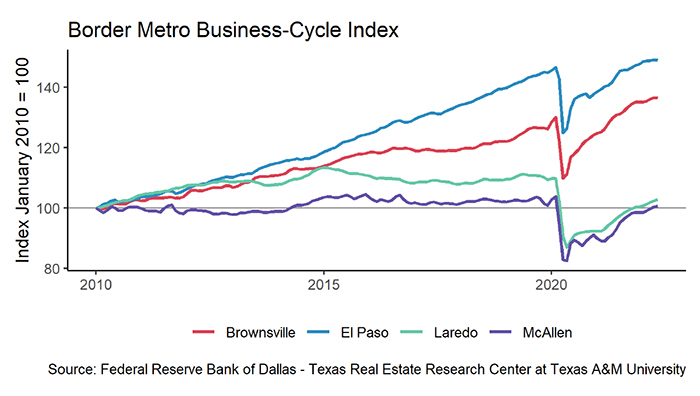 This marks the West Texas metro's 15th consecutive decline amid sluggish building activity despite stable demand. On the other hand, McAllen and Laredo inventories, supported by an influx of new listings, inched up to 8.7 and 4.5 months, respectively. As a measure of demand, the average number of days on market (DOM) corroborated soft sales. In El Paso and Laredo, the DOM ticked up to 92 and 56 days, respectively, while the McAllen metric held steady at 87 days. 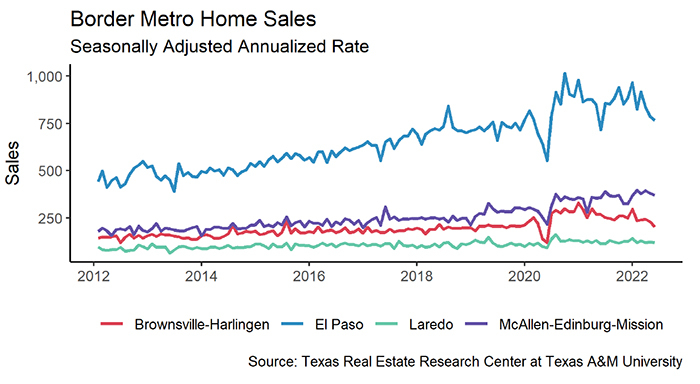 As with sales activity, the Brownsville market diverged from the other metros as the DOM dropped ten days below its four-year average, settling at 115 days. Laredo led the border with the highest median price at $173,900 but remained below the record high of $176,200 reached in September. Labor market improvements in McAllen and increased demand for existing homes in El Paso coincided with record highs of $154,200 and $167,500, respectively. In the West Texas metro, the resale market median price increased $14,000. Brownsville was the exception to rising prices, balancing at $145,500. 1 Mexican manufacturing and maquiladora employment is generated by the Instituto Nacional de Estadística y Geografía. Its release typically lags the Texas Border Economy by one month. 2​ The real peso per dollar exchange rate is inflation adjusted using the Texas Trade-Weighted Value of the Dollar. Its release typically lags the Texas Border Economy by one month. To see the previous month's report, click here. For the report from a year ago, click here.